"The James Beard Foundation Awards Committee is announcing an open call-for-entries for the 2009 James Beard Foundation Awards, the culinary industry’s most prestigious honors. Nominations for the Restaurant and Chef Awards can now be completed and submitted online at www.jamesbeard.org/awards. Downloadable entry forms for the Book Awards, Journalism Awards, Broadcast Media Awards, and Design and Graphics Awards programs are also available." And we know you'll like this part: "The Journalism Awards program has established a new James Beard Foundation Award for Blogs focusing on Food, Restaurants, Beverage, or Nutrition." New York, NY (October 15, 2008): The James Beard Foundation Awards Committee is announcing an open call-for-entries for the 2009 James Beard Foundation Awards, the culinary industry’s most prestigious honors. Nominations for the Restaurant and Chef Awards can now be completed and submitted online at www.jamesbeard.org/awards. Downloadable entry forms for the Book Awards, Journalism Awards, Broadcast Media Awards, and Design and Graphics Awards programs are also available. The James Beard Foundation Awards Committee has introduced changes in the Book, Journalism, and Restaurant and Chef Awards programs. Starting this year, the Book Awards program will allow publishers and authors to enter books into one of the following 10 permanent categories: Baking & Desserts, Cooking from a Professional Point of View, General Cooking, Healthy Focus, International, Reference & Scholarship, Writing & Literature, Single Subject, Beverage and American Cooking. As always, the Book of the Year will be chosen from the winners of each of those categories. The book photography category also will continue, and the Book Awards committee will choose a book for entry into the Hall of Fame. In addition, the Journalism Awards program has established a new James Beard Foundation Award for Blogs focusing on Food, Restaurants, Beverage, or Nutrition. Blogs have become an essential part of today's evolving media landscape. They provide journalists from both traditional and nontraditional backgrounds with an immediate, direct outlet for their work, and open up an unprecedented avenue for vibrant dialogue with readers. With the addition of this vital new category, the James Beard Foundation recognizes the tremendous impact that blogs have had on food journalism, and their importance to the future of the medium. As in the past, newsletters and online entries are eligible and encouraged to enter four Journalism Awards categories: Wine, Consumer & Nutrition, Restaurant Reviews, and Columns. Finally, within the Restaurant and Chef Awards program, the criteria for Outstanding Restaurateur Award has been changed to better reflect the intention of the award, which is to honor those outstanding restaurant professionals whose expertise has been acquired and exercised outside the kitchen. The Outstanding Restaurateur Award is now defined as a working restaurateur who sets high national standards in restaurant operations and entrepreneurship. Candidates must have been in the restaurant business for at least 10 years. Candidates must not have been nominated for a James Beard Foundation chef award in the past 10 years. 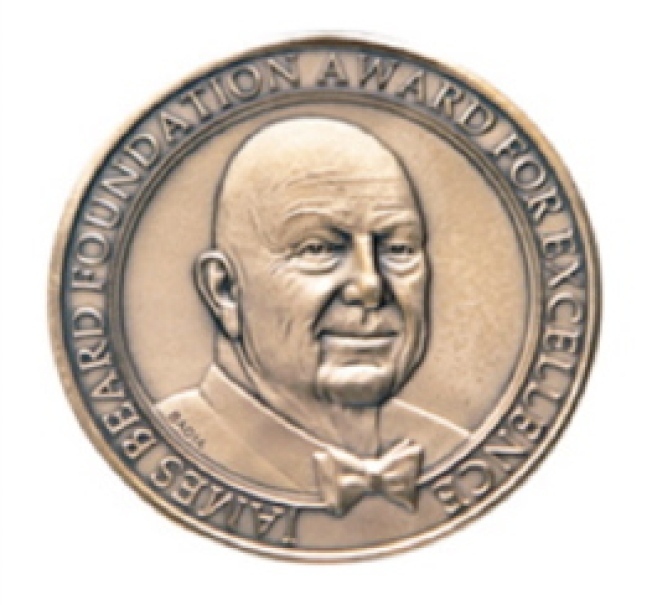 The James Beard Foundation Awards recognize outstanding achievement within the fine food and beverage industry. The Awards honor professionals including cookbook authors, chefs, restaurateurs, winemakers, journalists, broadcasters, and restaurant and graphic designers in the United States. The Awards are open to any industry professional who meets the criteria. Nominees will be announced on Monday, March 23, 2008. James Beard Foundation membership is not required for participation in the nomination process or to win an Award. Ballot tabulation is handled by Lutz and Carr, an independent accounting firm. The James Beard Foundation Awards Gala will be held on Monday, May 4, 2009 at Lincoln Center’s Avery Fisher Hall in New York City. The James Beard Foundation Media Awards will be presented on Sunday, May 3, 2008 at a separate event at the Hudson Theater at the Millennium Broadway Hotel in New York City. Award winners will receive a bronze medallion etched with the image of the late James Beard, the esteemed chef, cookbook author, and food journalist. For more information about the James Beard Foundation Awards, please contact Yvon Ros at 212.627.1111 x561 or email yros@jamesbeard.org.